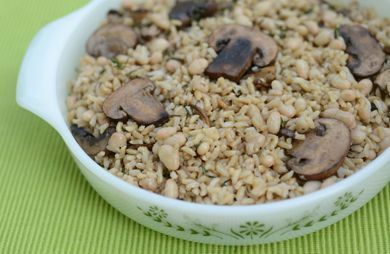 A hearty side or a light meatless entree, this savory dish is packed with flavor and fiber! A hearty side or a light meatless entree, this savory dish is packed with flavor and fiber! This dish goes great with beef. Meanwhile, heat a medium skillet over medium-high heat, add the oil, then the onions. Cook for three minutes, then add the mushrooms, thyme and black pepper. Cook for five minutes, until the onions are starting to turn brown and the mushrooms have darkened in color. Stir in the beans and rice, and cook another two minutes.